The best and sweetest tomatoes are the tomatoes in September. Although we don't grow tomatoes in the garden we buy them twice weekly at the Farmer's Market. From big red tomatoes, to big yellow tomatoes, to a variety of colors of cherry tomatoes, we feast on tomatoes all summer long. What better way to celebrate our favorite vegetable than with a luncheon made up entirely of tomatoes. 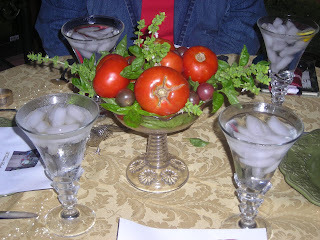 What better centerpiece for a tomato luncheon that an antique bowl filled with both tomatoes and garden basil. From soup. 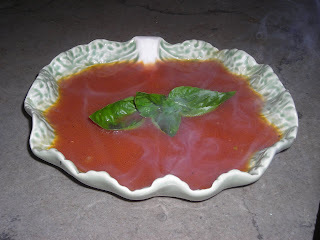 A roasted tomato soup from Ina Garten, The Barefoot Contessa, garnished with a sprig of garden basil and served in the shallow bowls in the shape of a cabbage leaf. To a wonderful tomato and blue cheese tart. The recipe found on a favorite website, posted by bakergirl, was a success. Baked in my newest pan -- the square tart pan. 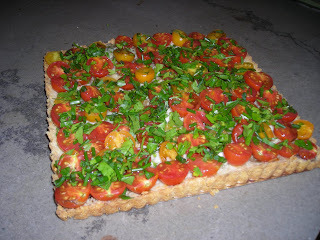 It made a beautiful presentation and I liked the roundness of the tomatoes with the squareness of the tart. To go with, a salad of Farmer's market arugula with a lemon olive oil and vinegar dresing, topped with a heirloom cherry tomato. 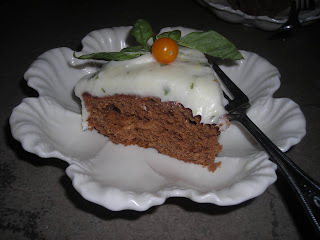 Yes, we even served tomato for dessert -- a tomato soup cake frosted with cream cheese frosting to which I added lemon extract, lemon zest and minced basil. It was a great lunch for a rainy almost fall day. We were reminded that soon, summer and it's tomatoes would be gone. 1. For the crust, place four, cream cheese, butter, salt and cayenne pepper in a food processor. Pulse until mixture resembles coarse meal. Remove and knead mixture into a smooth mass, then press it with our fingers in an even layer over the bottom, -- not the sides-- of a 9 inch tart pan with removable bottom. Smooth dough with the back of a spoon (The crust will be pretty thick) Freeze crust 15 minutes to firm. 2. Position rack in center of oven and preheat oven to 375 degrees. Bake crust until golden brown, about 30 minutes. remove crust from oven and cool 5 minutes. 3. Sprinkle cheese evenly over crust. Arrange tomatoes in a single layer over the cheese, cut sides up. Whisk together oil and vinegar in a medium bowl and drizzle over the tomatoes, then sprinkle with salt. Return to oven and bake until cheese has melted and tomatoes are hot, 10 to 12 minutes. 4. Cool tart 5 to 10 minutes and then remove sides of tart pan. (Tart can be made 3 hours ahead. Leave tart at cool room temperature and reheat in preheated 350 degree oven until warmed through, 8 to 10 minutes. 5. To serve, place tart on a platter. Mix together parsley and green onions. Sprinkle over tart. Cut tart into thin wedges and serve with paper cocktail napkins or cut into 6 slices and serve on plates with forks for a first course. Either way, this tart. 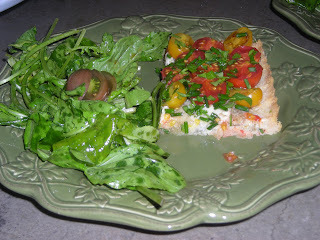 with its flaky crust and delectable topping of sweet tomatoes and salty cheese, is a wonderful opener. *I used both yellow and red cherry tomatoes and alternated them. I had forgotten the onions and so used garden chives instead. What a terrific idea for a great and different lunch! Martha, cute idea! I love those cabbage leaf dishes! You have a lovely home and amazingly enough I have several similar soapstone pieces in my collection! I have been collecting soapstone for many years! A strict observance of the written law is doubtless one of the high duties of a good citizen, but it is not the highest. The laws of necessity, of self-preservation, of saving our country when in danger, are of higher obligation.